Cowrie shells are often used as a substitute for elk teeth on Plains Indian women's dresses. 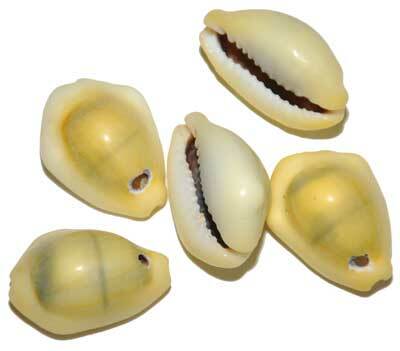 Money cowrie shells are a light yellow. These are drilled and have a single hole at the small end of the shell and average about 1/2 to 3/4 inch in length. Sold in quantities of 100. 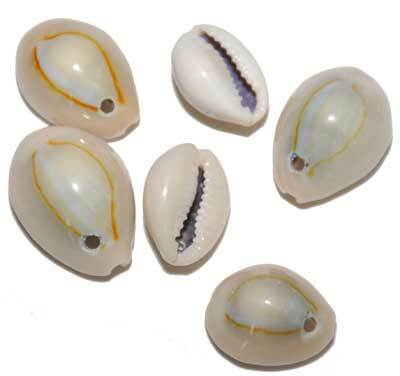 Purple Top cowrie are a cream color with a purple top. These average about 1-inch x ¾-inch and have one hole drilled at small end of the shell. Ringtop cowrie are cream color with an orange ring. These are drilled and have a single hole at the small end of the shell. Size vary but average about 3/4 inch in length. Sold in quantities of 100.